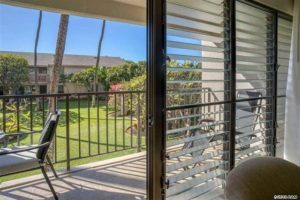 Brought to market a few days ago, Kihei Akahi C203 is a neatly decorated south facing unit with plenty of natural light and air flow. 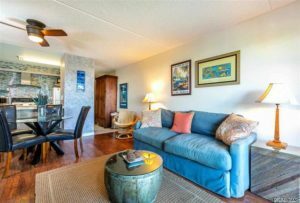 Located across the street Kamaole Beach Park II, the location of the complex is the unit’s most attractive feature. 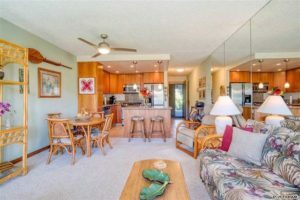 The C building in Kihei Akahi is desirable among buyers for its set back location in the community, while offering quick access to South Kihei Road and the beach. In addition to the interior living, the unit boasts a spacious 70 sqft lanai that is ideal as a private sitting area for relaxing. While the complex was built in the 70’s, it was upgraded over the last decade. Some upgraded features include: custom cabinetry with smooth closing drawers, granite countertops, pendant lighting, stainless steel appliances, plus, floor to ceiling mirrors, new light fixtures, sleeper sofa, tiled lanai, washer and dryer in the unit, and recessed lighting in kitchen and bathroom. The unit has not been rented out on a short basis, so there has been minimal wear and tear on the unit. Similar 1 bedroom units on VRBO command around $150/night. 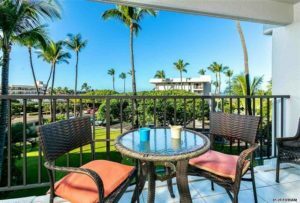 Kihei Akahi D205 came to market at the same time as the unit above, but is in D building which as at the furthest end of the Kihei Akahi complex with the 2nd pool and bbq area fronting the middle ground between the D, C, and B buildings. The D building is valued by owners for its year round sunsets and beautiful ocean views from its slightly elevated location. The unit has been tastefully remodeled over time, sleeps four, and is being sold fully furnished. With no unnecessary cabinets to block the view the living room/dining are flows seamlessly into the cleverly designed kitchen, offering the maximum amount of light and airy openness. The Kihei Akahi market did not get off to the best start in 2018 with only 1 unit sold through the entire first quarter. However, once it hit Q2, the market picked up some moment where it saw 50% of all units sold in 2018; April saw 3 units sold, while May saw 4 units sold. It isn’t atypical for a Kihei condo market to see most of its sales made up at one time. Bunches of sales will usually cluster around 1-2 months after a busy season once the deals are finally pushed through escrow. October was the next most successful month where it saw 3 sales within just a few weeks of each other. Most impressive has been the strong demand for the units. All 14 units sold only needed 6 months to complete the sale, from listing to closing. More than half of the units only needed 3 months to secure a new owner. Kihei Akahi actually has one of the lower barrier to entries among the Kihei condos. The lowest priced unit sold closed for a price in the upper $200k range; while on the upper end, the highest priced unit closed for $600k. The middle market around $400k was the most dominant as it represents more than 50% of the units sold. To get a complete idea o the market, check out our Kihei Akahi sold data. Kihei Akahi has a variety of units for sale with 50% of them being new listings coming to market within the last week, while the other 2 have been listed since 2018. The market is currently top heavy with all 4 units being considered in the upper half in terms of pricing. Coming off a strong 2018, expect plenty of interest from buyers who missed out on properties in 2018. To stay one step ahead and continuously in the know, subscribe to our Kihei Akahi new listing email alerts. Our team has been blessed to have been part of this extraordinary community since its creation in 2005. Our real estate information office is located on site and is open 7 days a week. It truly brings a smile to my face meeting first time guests, return visitors, and full-time residences that love and embrace the Maui lifestyle. We’d like to extend an invitation to you to feel free and stop by the on-site Ho’olei real estate information office, which is open daily, before the reservation desk, from 9:00AM – 5:00PM.